We are the prominent Manufacturer, Exporter, and Supplier of various types of Centrifuge Filter Bags. Centrifuge is the common media for separation of solid from liquid. The centrifuge filter contains a basket with centrifuge bag, which is placed to retain the solid into the basket. The Centrifuge Filter Bags are manufactured by using selected fabrics, keeping in view the productâ��s filtration and porosity factors. These Centrifuge Filter Bags are offered in an assortment of specifications and can also be modified as demanded by the clients. Dimensional stability of Centrifuge Filter Bag is maintained by using processed and heat set fabric, as it has remarkable superiority than that of raw or grey cloth. 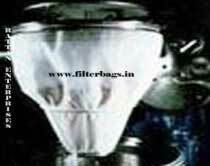 Stitching of Centrifuge Filter Bag is done on sophisticated imported machines.